So the bloodletting continues at a furious pace. One last big thing on my immediate list is a Fiamma awning. Got 1der's brackets already. So I see a 10'1" and an 11'6" awning. Both would fit on my bracket placements, but just wondering what others have done on their EB's. Go with the 10ft awning. It is a good balance of covered space, weight and visual on the side of the van. Either SMB Fresno or Aluminess will be your best source/price. Call them first to make sure it is in stock and pick it up. Shipping will be expensive! I can help at Aluminess, if you need anything else. Give me a call / email/ PM. Ray, what's the best size for a RB van? Still 10ft? I have the 3.5m / 11.5' awning on my EB and wouldn't want it any less wide. The awning case as mounted on our van extends approx 1ft forward of the B-Pillar and 1 ft aft of the rear bracket. This works well with our passenger side ladder. An 11 ft awning would extend over the the top of the ladder. This is not so much of a problem when the awning is retracted as you can reach over the case. If the awning is extended, access to the roof is not going to be via the ladder since it will be under the awning. Here's a 10 foot Fiamma on an RB. If you have a ladder you can slide the awning a bit more towards the front. My ladder is on the driver's side, I had to Jack it up to meet the pinch weld and snapped one of the studs on the top mounts, but that is another story. 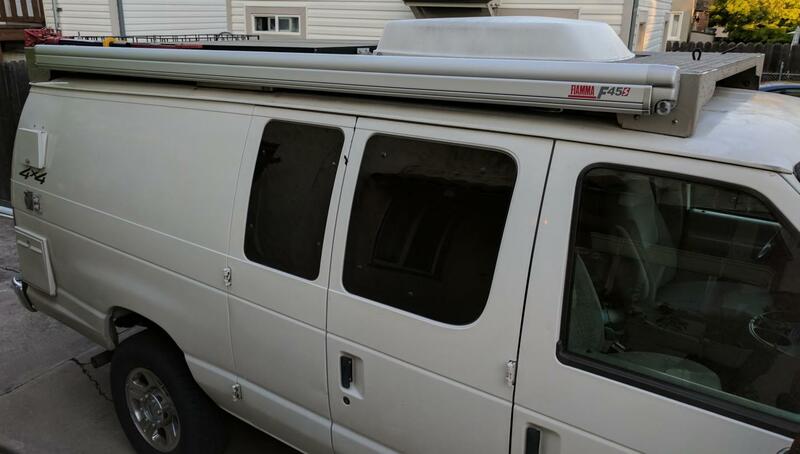 Because i have a window van, the rear bracket needs to rest between the windows. I measured it and it looks like it will be fine for the 10 ft. 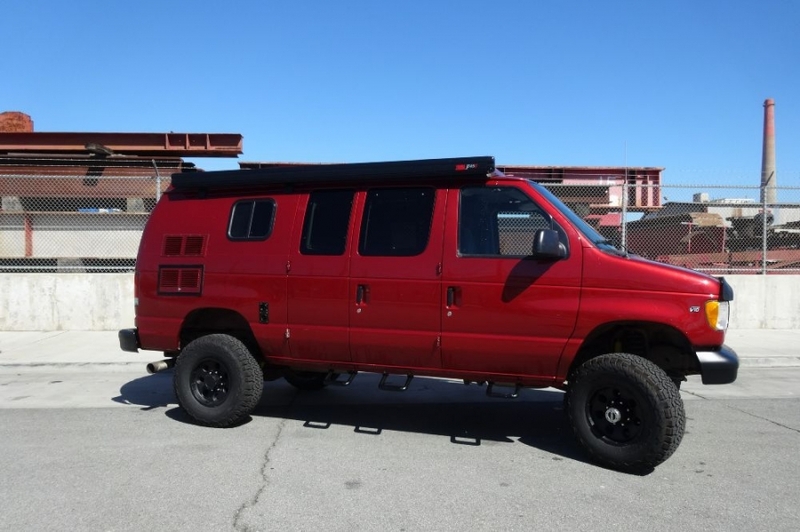 The 11'6 would probably over lap the front door about 6" and come back to almost the rear of the van. I will measure again, maybe 3 more times before I order up. Pretty much a perfect fit onto the side of that rack. That's kind of what I figured madscience. Pretty darn good fit. I may go long. Just because I can. The bumper I am fabbing up will allow the galley box to swing around 180 so my kitchen will be right there. Be nice to have shelter to cook under with the extra length. Flux - Galley box 180 sounds nice! If you are going for the F45S 3.5m, make sure it is the F45S and not the F45 Eagle. The Eagle is without legs and it will not work with the brackets. Check with SMB West and see what they will charge for the 3.5m awning and let me know. I will see what I can do on pricing. Usually they have better pricing since the freight for them is amortized over pallets of units. Thxs!